Many Republican lawmakers in 2018 opposed a provision in Ducey’s Safe Arizona Schools plan known as a Severe Threat Order of Protection, which is aimed at temporarily restricting a person’s access to firearms until he undergoes a mental evaluation. But Democrats believed the bill didn’t go far enough and refused to vote for it without stricter gun control provisions. Lawmakers on both sides of the aisle said after Ducey’s State of the State address Monday that they still have the same concerns they had last year. And any move to appease one side will likely cost the governor votes from the other. Freshman Rep. Jennifer Longdon, D-Phoenix, a gun control activist who uses a wheelchair as a result of a 2004 shooting, said she can’t say how she’ll vote on Ducey’s plan until she sees it. But she opposed the version that Ducey introduced last year, and said the state needs stronger “red-flag laws” than it contained. “Gun violence prevention is near and dear to my heart, and I definitely have strong opinions,” Longdon said. Meanwhile, Sen. Eddie Farnsworth, R-Gilbert, said he and other Republican lawmakers had problems with the STOP provision of Ducey’s plan, which allowed a person to be evaluated for up to 21 days upon a judge’s order. During that time, a person under evaluation would not be allowed to possess or purchase firearms. Farnsworth said he doesn’t know exactly what changes Ducey would have to make for that part of bill to be acceptable. “I think the intent’s good. We just have to find a way to do it without violating the Constitution,” said Farnsworth, who chairs the Senate Judiciary Committee. Rep. Bob Thorpe, R-Flagstaff, said there’s a fine line between protecting children and making sure the state doesn’t impede on Arizonans’ personal liberties. “Those kind of personal liberty issues are difficult to come to grips with,” he said. 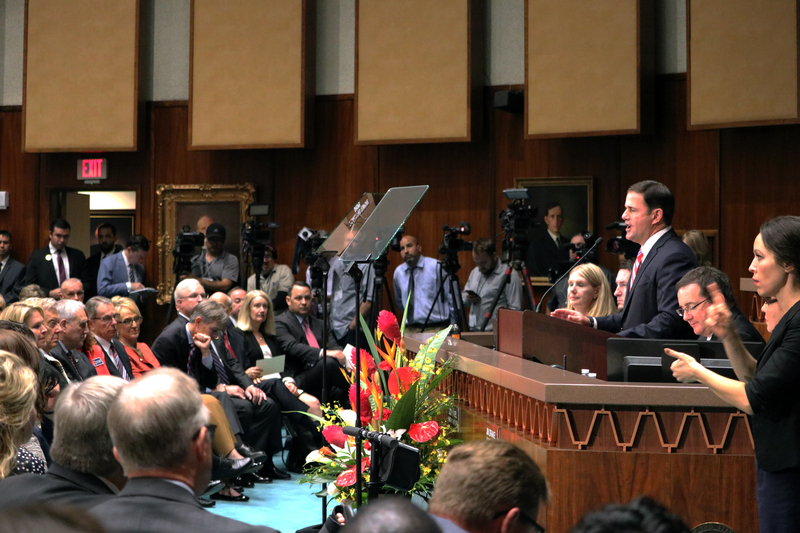 In his State of the State address, Ducey said his executive budget proposal, which he’ll unveil on Friday, will include some provisions of his school safety plan, with more funding for parts of it than he called for last year. He said his plan will have enough money to put a police officer on every campus that needs one. “This is simply too important an issue to let partisan politics and special interests get in the way. We’ve got a responsibility to do something for our kids. And we’ve got to do it this session,” Ducey said. But the governor didn’t say what, if any policy changes he’ll make to the plan. Part of the problem with last year’s plan was the timing, several lawmakers said. Ducey didn’t unveil the plan until March, after a shooter at Marjory Stoneman Douglas High School in Parkland, Fla., killed 18 people and activists began agitating in Arizona and elsewhere for stricter gun control laws. That didn’t give legislators much time to debate and negotiate. Thorpe said having more time could make a lot of difference. “If it had actually been (introduced) at the beginning of session, where we could really have a lot of debate, bring the public in to give us their opinions as well, we probably could have pushed it further. But because it was so late in the session, it was very tough to get our arms around it,” Thorpe said. Rep. Reginald Bolding, D-Phoenix, said Ducey will also need to work with Democrats from the start and accept their input, as he did in 2018 with his bipartisan opioid bill. “When it came to the gun proposal, the governor simply said, ‘Here are my bullet points. I’m not taking any Democratic ideas.’ And we know that’s not how you negotiate,” said Bolding, who said he wants to a more comprehensive approach to preventing gun violence. In addition to the Severe Threat Order of Protection provision, The Safe Arizona Schools plan would have increased funding for counselors and resource officers at schools, created a tip line for reporting possible threats and enhanced Arizona’s background check system for firearms purchases. The proposal died after Senate Republicans removed the STOP provision.